Mork, N., & Griffin, S. (2015). Perceived safety and benefit of community water fluoridation: 2009 HealthStyles survey. Journal of Public Health Dentistry. I summarise the reported results in the following graphs. 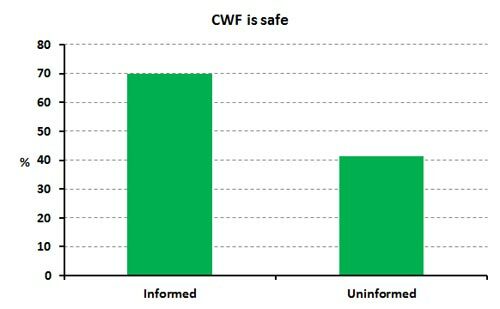 Most (55.3%) of the surveyed people agreed or strongly agreed that CWF is safe. Only 13.2% disagreed or strongly disagreed it was safe and 31.5 % were neutral on the question. However, the proportion of people believing CWF is safe was much higher in the group which had knowledge about CWF – about 70%. On the other hand, 41.3% of people with no knowledge about CWF still believed it to be safe. Unsurprisingly, the survey showed that almost half of people who claim childhood vaccination is unsafe also claim CWF is unsafe. About 73% of the respondents believed that CWF had some benefit (57.3%) or great benefit (15.5%). 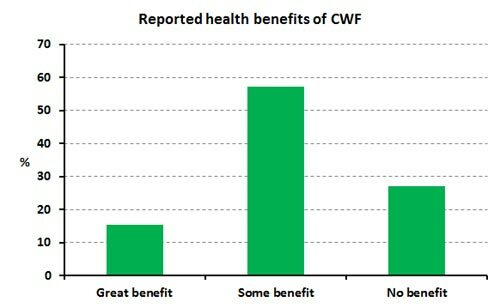 Only 27% reported that CWF had no benefit. Regression analysis of the survey data showed that perceived CWF safety and benefits increased with CWF knowledge, perceived vaccine safety and income. These figures suggest that the recent prediction by Paul Connett, Executive Director of the Fluoride Action Network (FAN), that CWF in the US would disappear within 18 months is delusional. He appears to be carried away by FAN’s occasional victories in stopping or preventing fluoridation in local communities. He should take more notice of the overall figures which show increases in coverage of CWF in the USA in recent years. However, there is still a sizable minority who believe CWF is harmful or has no benefit. Given that slightly over 40% of respondents in this survey reported they had no knowledge about CWF this provides scope for the misinformation and scientific distortions of anti-fluoride activists to have an effect. There is still a need for oral health professionals, and supporters of evidence-based health policy, to campaign for CWF and counter the misinformation opponents promote. This entry was posted in Health and Medicine, SciBlogs, science, Science and Society and tagged fluoridation, fluoride, SciBlogs. Bookmark the permalink.